Aside from meeting a bunch of wonderful new friends during my trip to Maui, I was floored and impressed by the emphasis many restaurants and chefs had on sourcing locally and sustainably. Although that way of thinking is quite forward, it actually stems from a real necessity and problem that affects Hawaii. Did you know that despite Hawaii's beautiful weather and rich soil that it actually imports almost 90 percent of its food? What would happen to such a dependent island if a shipping strike like the one we had in Los Angeles recently stopped cargo from reaching the island? How long would Hawaii be able to survive without imported food? 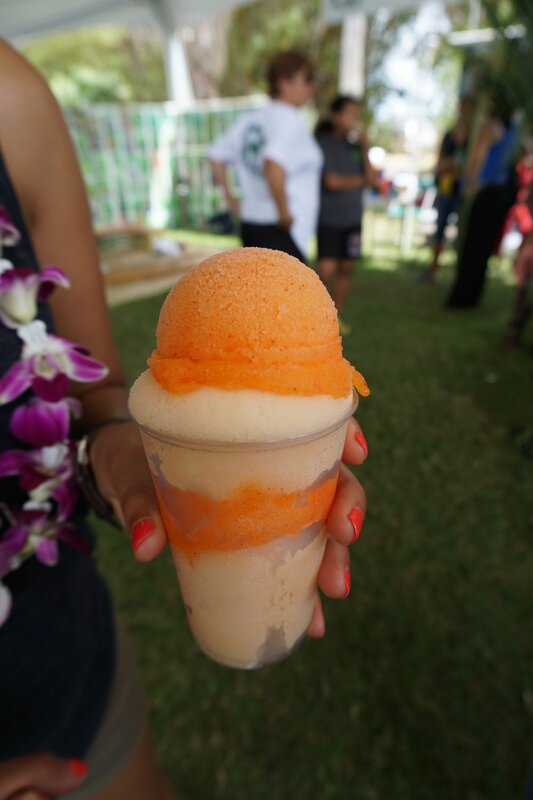 This was the theme of Maui Ag Fest, which is a annual event that brings together farmers, ranchers and their products. Locals and visitors get to meet with the very farmers, ranchers, and chefs that grow and make their food in a fun festival atmosphere. I started my day at the Ag Fest by judging the Live Chef's Challenge. 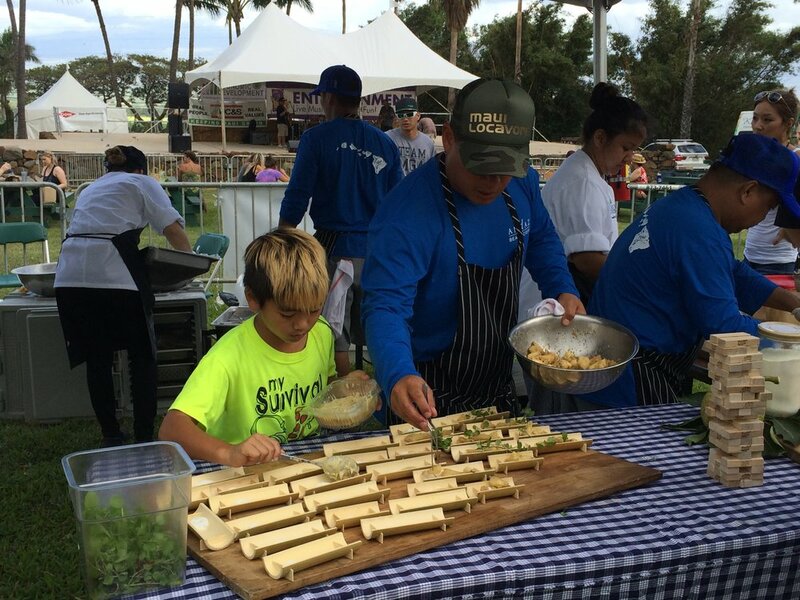 After the first event, I had two hours to kill before the big Grand Taste event, which features local, fresh and flavorful bites made by 12 Maui chefs. I was so excited I had two whole hours walk around and check out all the amazing local Maui food booths. Two hours was plenty of time, right? Wrong. I was so wrong. I shopped so hard, sampled so hard until I dropped and ran out of time. If you're a frequent follower of my Instagram account, you probably already know that I'm obsessed with sugarcane juice. I have to get my fix at least once a week. Ocean Vodka's booth has different types of sugarcane and it was fascinating just to learn about the different types there were and how different the tastes were. 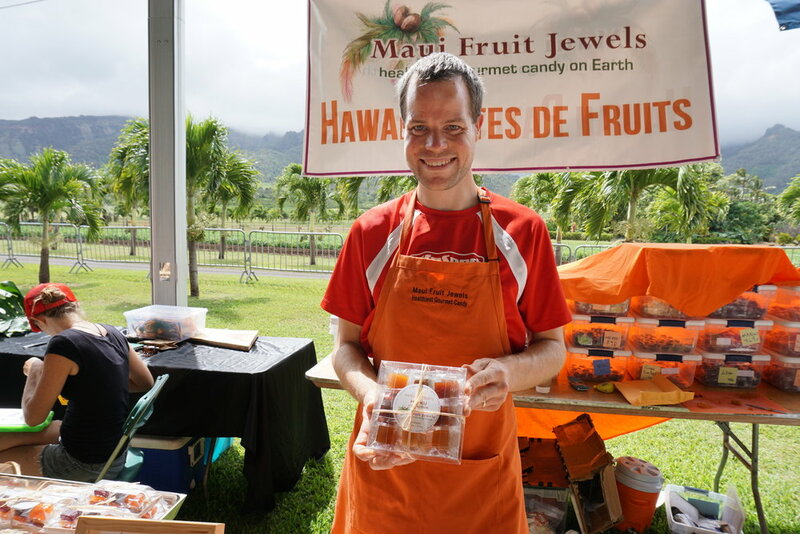 Then I met Chris, of Maui Fruit Jewels and I was stopped in my tracks. I was 30 minutes in and I had made it down 2 booths with Amy. Maybe two hours wouldn't be enough time with all these great products? Crap! But how could I not stop by each one? These gourmet soft jelly candies are made with Maui ingredients! More than 50% of the jelly candies is real fruit, vegetable, or whatever the main ingredient may be. The rest of the candy is made with organic sugar, glucose syrup imported from France, pectin, and citric acid. There is no food coloring or flavoring whatsoever added to each candy. I bought multiple sets of sampler boxes which included delicious flavors like lilikoi, lavender, pomegranate, pineapple ginger, etc. 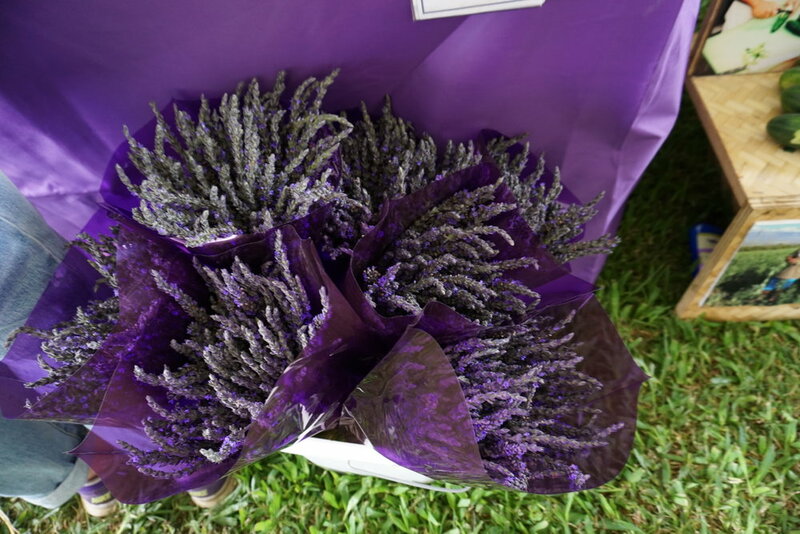 I was intent on getting to another 5 booths when I stopped again for the Lavender stand. All natural products made with Lavender? Lavender jelly, chapstick, etc. At this point, my gigantic purse was already so heavy from everything I had bought. But then I saw jam. I love jam. A voice in my head was telling me that I had previously bought lots of lilikoi butter that was sitting in my hotel room. 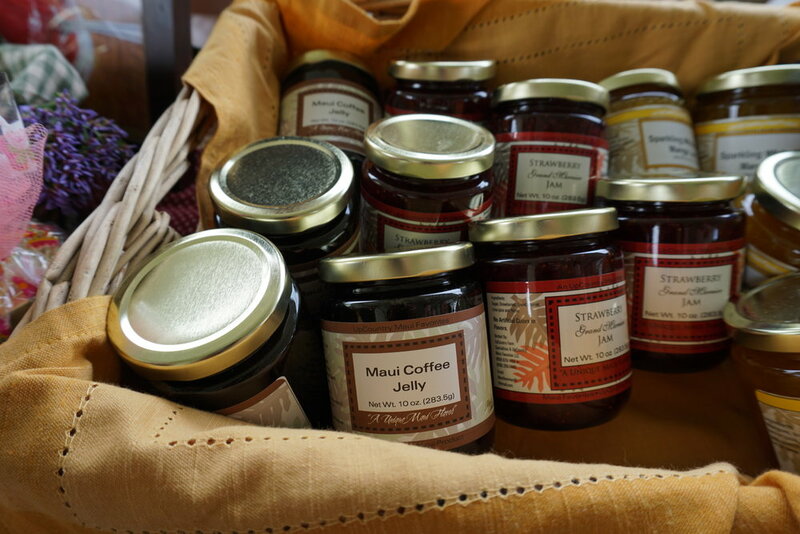 I ignored that little voice and bought some Sparkling White Wine Mango Jam and a jar of Maui Coffee Jelly. I spotted some Hawaiian Chili Pepper Salt and I stopped again. I think I may have a food shopping problem. All natural chapstick with unique Hawaiian flavors. By now my purse was full of clinking glass jars from the jams I had bought. I saw spicy pineapples and it was game over. I'm so weak for good food. In the midst of all my shopping, I spotted the Paradise Tropical Ice cart. This was a mix of two flavors that I picked out: POG (Passionfruit, Orange, Guava) and Li Hing Mui real fruit shaved ice. I saw a lemonade stand that served Passionfruit lemonade so I had to stop by. What was neat about Wow Lemonade is they use only locally sourced fruits to produce their handcrafted lemonades. They have lemonade made with locally grown kale, watermelon basil, lychee strawberry, mango, and passionfruit.They also do not pasteurize their drinks so that you can get the most nutrition and live enzymes possible from each drink. And before I knew it the two hours were up and I didn't even graze the surface of the amazing produce that was there. It was time to check back for the Grand Taste Event to begin! The 12 chefs were hard at work preparing and serving their dishes. 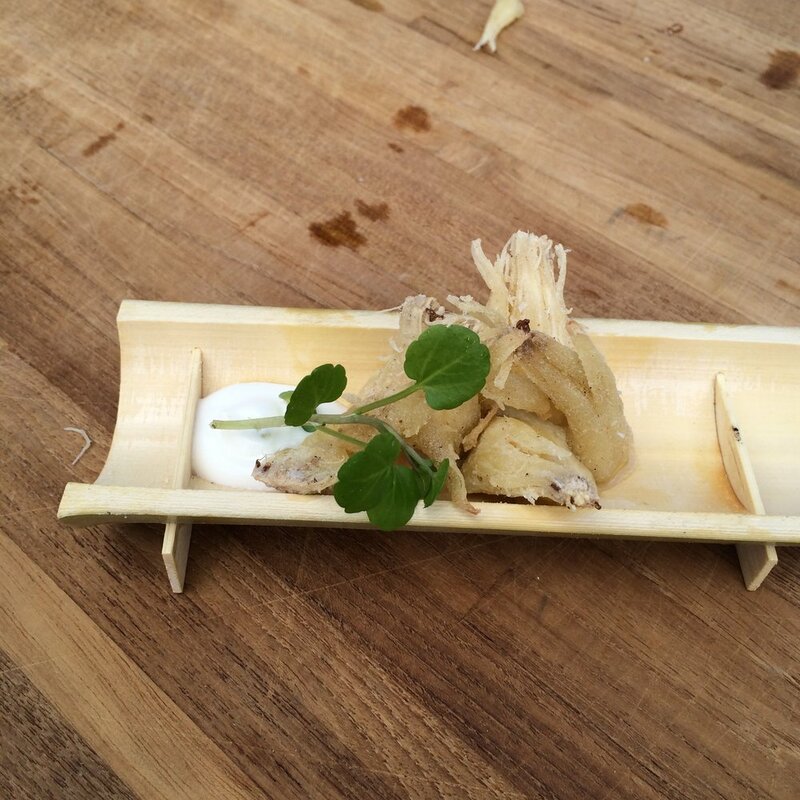 I was excited at the chance to take a bite and see what creations come from pairing local chefs with local farmers. If I had learned anything from the Live Chef's Challenge earlier in the day, I knew that the judging process would be difficult. Look at all the action go down! Here's a peek at the final products! 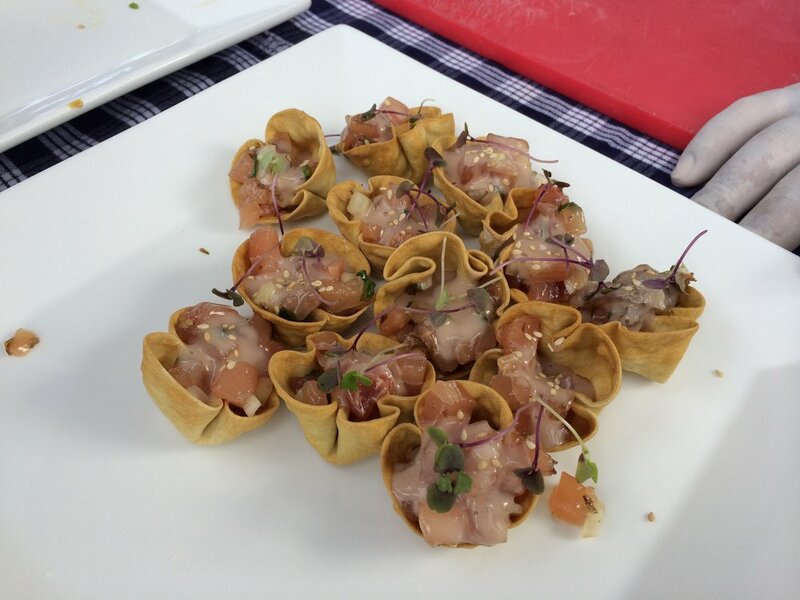 Smoke Daddy's Faux Gyro with Chia Cracker, Pigeon Pea Hummus, Smoked Tofu, Ka'ana Kitchen's Ulu Popcorn & Opelu, Migrant's Napili F.L.O Green Taco, Maui Executive Catering's Beef & Blooms Pepperoni, Panisse, Pickled Onion, Pineapple Grills' Nopales and Kobocha Tacos, Pulehu's Anuenue Carrot Tots, Maui Cattle Co. Beef Bacon, Celery Crema, Three's Restaurant's Kula Lavender and Surfing Goat Dairy Cheese topped with Sweet Onion & Li Hing Mui Jam, Ko's Sesame Korean Beef Patties with Ko Choo Jang, A Saigon Cafe's Sweet Shrimp. My top favorites were the Popcorn Ulu from Chef Isaac Bancaco, the Kiawe Roast Pork with the Root Beer Sauce from the Three's Bar and Grill team. Eat. Judge. Repeat. I ended up turning my clipboard and judging sheets into a makeshift table. 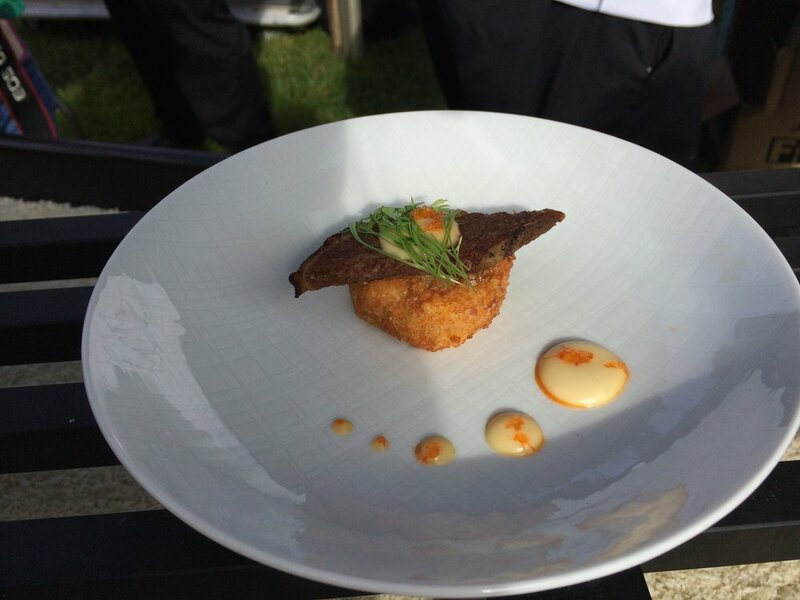 Chef Jeff Scheer for “Fan Favorite” for his panisse topped with 200-day cured pepperoni made from Beef & Blooms beef. 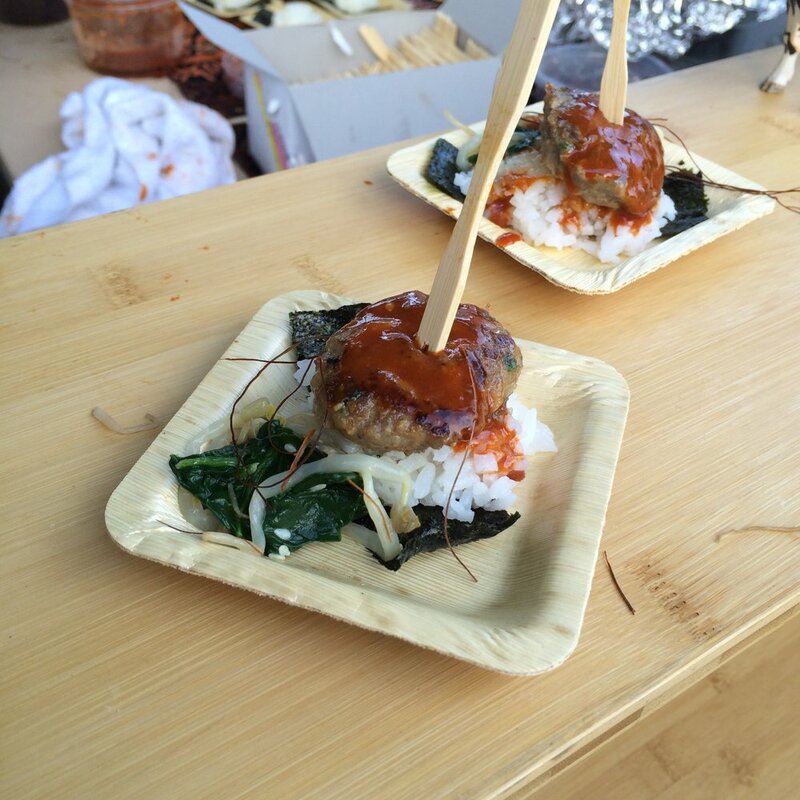 Chef Charlie Owen of Hula Grill Kaanapali for “Best Use of Proteins” for his Kurobuta pork musubi on bamboo sticky rice with pork from Malama Farm. 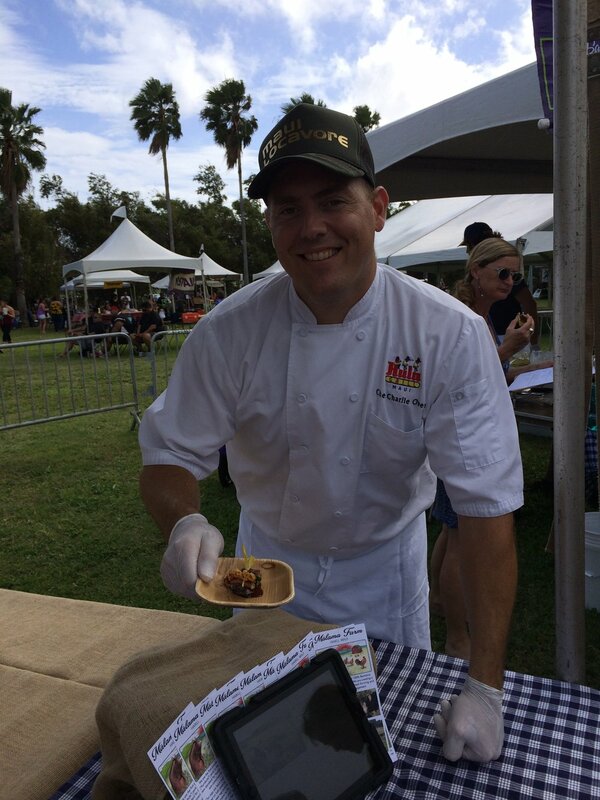 Chef Issac Boncacao for “Best Veggie Dish” for “Ulu Popocorn & Opelu” made with taro and breadfruit from Nohoana Farms. Chef Mike Lofaro for “Honorable Mention” for Surfing Goat Dairy goat cheese cornets with radish sorbet, fennel pollen and ginger. Everything was delicious. It was a really tough call as a judge, but I think the winners really deserved it. Here's a group shot of all the chefs from the Grand Taste event after the awards ceremony as well as my fellow judges and the lovely team that put this event together and made sure it went off without a hitch. Make sure to check out my lovely judges at their respective online homes: Amy of Backyard Bite, Carolyn of Food Gal, Sarah of Lettuce Eat Kale, Joanne of One for the Road (not pictured). So I Arrive in Maui, Now What?